This Web site is provided on an ” as is,” “as available” basis without warranties of any kind including those of Title, Fit for a purpose, Non-fringement or Mercantability or any warranty arising from a course of dealing, usage, or trade practice. All materials posted on this site are subject to copyrights owned by The Nitai Medical & Cosmetic Centre and other entities or individuals. Prohibition applies to Reprinting, Reproduction or re-transmission without prior written permission from Nitai Medical & Cosmetic Centre or the other copyright owner. Unauthorized use of this material FOR PROFIT will result in legal proceedings against the abuser. 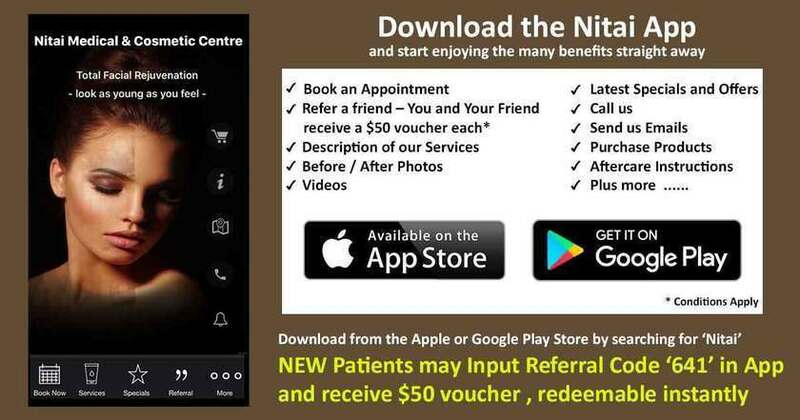 All website users are advised to consult their doctor concerning medical advice or treatment as the information posted here by Nitai Medical & Cosmetic Centre or any third party is not intended to replace personal consultation with a qualified medical practitioner. The efficacy, appropriateness or suitability of any product or treatment described within this website or in any publication on any website linked to this website is neither claimed nor endorsed by Nitai Medical & Cosmetic Centre. There have not been any representations or warranties of any kind in the provision of the materials and information provided on this website. All liability arising from this website is disclaimed, by Nitai Medical & Cosmetic Centre, to the fullest extent permitted by law. The accurateness, completeness or currency of the information or facilities accessible via this website are not represented or warranted by Nitai Medical & Cosmetic Centre nor that this website will be free of defects, including but not limited to other harmful elements. All risks and costs arising from the use of this website or any website linked to this website are to be assumed by the user. A Product should not be used without appropriate professional medical advice. The actual use of the Hair and Skin products are beyond the control of both the supplier and the author, no liability will be accepted by either party. No guarantee is given as to the effects of recommended products. These are used at the user’s own discretion and neither the supplier nor Nitai Medical & Cosmetic Centre will accept legal responsibility for any health problems that result from the self-help methods described. If in doubt a qualified medical practitioner should be consulted. All responsibility for the use of this Web site is assumed by the user. Nitai Medical & Cosmetic Centre or anyone else involved in creating or maintaining this Web site is NOT liable under any circumstances, including negligence, for any Direct, Indirect, Lost Profits that result from the use or inability to use the Web site, Special or Consequential damages, and/or any other Web sites which are linked to this site, including, but not limited to, reliance by a visitor on any information obtained via the Web site; or that result from viruses, errors, defects, deletion of files,interruptions, omissions, mistakes, or any failure of theft, destruction, unauthorized access, communications failure or performance. Nitai Medical & Cosmetic Centre does not necessarily constitute or imply its sponsorship, endorsement, or recommendation through any references to a service, product, hypertext link to a third party or other information by trademark, trade name, supplier or otherwise. Nitai Medical & Cosmetic Centre may be a distributor of the content supplied by third parties. Nitai Medical & Cosmetic Centre is not responsible for any material posted by third parties and any services, statements, opinions, advice, offers or other information or content made available by third parties are those of the respective author(s). The accuracy or usefulness of such material cannot be endorsed in any way nor vouched for by Nitai Medical & Cosmetic Centre. Any liability associated with material posted by third parties is expressly disclaimed by Nitai Medical & Cosmetic Centre. Due to the large number of emails received we are often unable to answer all enquires although we attempt to answer all queries. All email medical advice is provided with the best intentions. It is difficult however, to definitively ascertain the exact nature of the problem and an exact solution for the problem without a proper clinical history and examination in person.